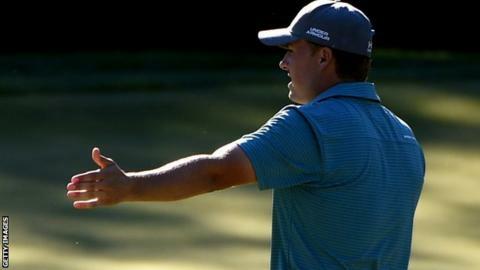 Masters and US Open champion Jordan Spieth missed the cut for the second week in a row as Charley Hoffman took the lead at the Deutsche Bank Open. Spieth, replaced as world number one by Rory McIlroy last week, was six over after a 73. It is the first time in his career he has missed consecutive cuts. McIlroy birdied the last for a 74 and is two over, 14 shots off the pace. Hoffman, the 2010 champion, is three clear of Brendon de Jonge after a 63 featuring eight birdies in 14 holes. "Normally my mental game is a strength of mine," said 21-year-old American Spieth, who missed the cut by three strokes having been five behind the mark at last week's Barclays event. "It's something I feel like I have an advantage over other players on. These past two weeks it was a weakness for me." Luke Donald and Ian Poulter slipped to 18th and tied 21st respectively at the TPC course in Boston. The Englishmen had been only two behind first day leader De Jonge, but Donald had a birdie and a bogey in a level par 71 and Poulter had a double bogey seven in a 72. McIlroy of Northern Ireland needed his closing birdie to halt a run of four bogeys in five holes but US PGA champion Jason Day is better placed, the Australian carding four birdies in a 68 to reach six under for the tournament. And Scot Russell Knox shares seventh only five shots behind Hoffman after seven birdies in a 65.